The US manufacturer of one of the UK's best-selling toys this Christmas has insisted the product is safe. 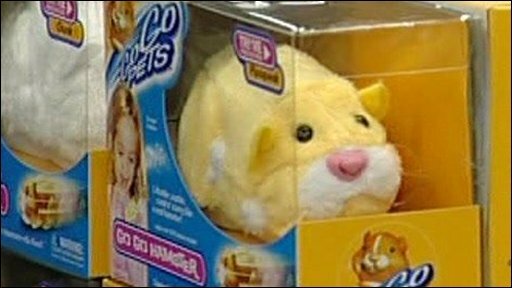 Cepia rejects claims from US consumer organisation GoodGuide that a chemical found on one of its Go Go Hamsters toys was at possibly dangerous levels. The firm also said that the Mr Squiggles toy had passed "the most rigorous testing in the toy industry". GoodGuide had alleged that the toy had more than the allowed level of the metal antimony. Professor Dara O'Rourke, from GoodGuide, said antimony "has potential health hazards related to it which, if ingested in high enough levels can lead to cancer, reproductive health and other human health hazards". The £9.99 battery-powered furry toy - which whizzes about the floor and squeaks when its nose is poked - has been one of the most in-demand children's gifts in the UK this Christmas, with several major retailers reporting shortages. 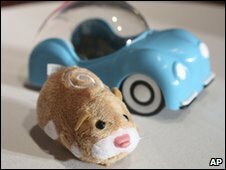 Character Options, the UK distributor of Go Go Pets - made in China and sold worldwide as Zhu Zhu Pets - also said the popular toy is safe and has been tested and passed by all relevant safety standards. Russ Hornsby, the chief executive officer of Cepia said: "We are disputing the findings of GoodGuide and we are 100% confident that Mr Squiggles, and all other Zhu Zhu Toys, are safe and compliant with all US and European standards for consumer health and safety in toys. "We are contacting the GoodGuide people at this moment to share with them all of our Mr Squiggles and Zhu Zhu Pet testing data so we can get to the bottom of how their report was founded." Mr Hornsby said he wanted to assure anyone thinking of buying either the Mr Squiggles toy or any other of its Zhu Zhu Pet range that the toys are "100% safe and in compliance with all US and European toy safety standards. "I have been in the toy industry for more than 35 years, and being a father of children myself, I would never allow any substandard or unsafe product to hit the shelves. That's why we always test to not only meet but also exceed safety standards." In addition, Character Options said that as part of its standard due diligence, the toy has been tested on three separate occasions by the company's own safety experts and found to fully comply with all EU standards. Jon Diver, managing director for Character Options, said: "Character Options is confident that Mr Squiggles and all the toys in the Go Go Pets collection are completely safe. "The pets are tested in independent accredited laboratories during the manufacture and again before shipment through our own internal diligence programme. Their safety has always been ratified." The company said that the toy had been further tested on three separate occasions by its own safety experts and also said it was found to fully comply with all EU standards. As well as Mr Squiggles, there are three other models of the toy pet - Chunk, Num Nums and Pipsqueak.